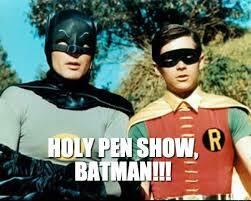 I can’t believe that the Baltimore Washington International (BWI) Pen Show is coming up in just a few short days! Another milestone is the fact we are on our 4th location of this ever-expanding show! From the show’s humble beginnings in 2011 at the beautiful Masonic Temple in downtown Baltimore at the Tremont Hotel. (Everybody liked that place – even Lee C. didn’t complain about it) to a one-year appearance at the Marriott BWI to the Hilton Doubletree BWI for the last two years. Now the show has doubled in size, and those venues can no longer accommodate the show. So, for 2017, the BWI Pen Show has a new home at the Westin BWI. This modern (and much larger) hotel will be able to accommodate the 100+ tables we have already booked. Vendors from across the country will bring you the largest varieties of vintage and modern pens from the world over. We even have our own Chocolatier! This year’s BWI Pen Show will have more pen repair technicians (from Richard Binder, Mike & Linda Kennedy, Joshua Lax, Martin Ferguson, and others) on hand to repair your pens. This includes but is not limited to, sac replacement, nib tuning, adjustment, and grinding. The BWI Pen Show will also be featuring some of the finest custom pen makers. Richard Greenwald will be featuring his Fantasy Vanishing Point Collection, made from his own Flexigran. Hugh Scher of Kanilea Pen Co. brings Hawaii to the show with his collection of Hawaiian themed fountain pens. Other custom pen makers include Richard Kleinhenz with his hand-turned and finished collection of pens, Dale Penkala with his watch-themed pens, and Ryan Krusac the master of wood and other natural materials. If you’re looking for what’s new in the world of pens, the show is hosting several industry leaders. Anderson Pens from Appleton, WI and Vanness Pens from Little Rock, AR, and Crazy Alan’s Pen Emporium from NC, are making the long pilgrimage with their vehicles packed full of today’s latest and greatest writing instruments inks and accessories. Total Office, Toys From The Attic, Power Pens, will offer the limited editions of today and many others that are long sold out and are only found at a show like this. Kenro Industries of Mineola, NY will showcase the best and latest writing instruments. From brands like Aurora and Montegrappa (two of Italy’s prominent brands), and featuring limited edition pens from $800.00 to $8,000.00. Closer to home in North Carolina, Franklin-Christoph brings with them pens made right here in the US. Along with fountain pens, Franklin-Christoph has a wide selection of journals and leather pen cases. Franklin-Christoph is known for tuning and adjusting any nib they offer. As for the nib selection, I know it’s a lot more than fine, medium and broad. Bexley Pen from Columbus, OH goes way back to the pen business. They’re the first company to start making pens in the US when we saw many years of contraction as ballpoint and disposable pens came to market. A special guest and close friend, Michael Hochstetler, of Michael’s Fat Boy Company has agreed to make the long journey to Baltimore. Mike and I go way back, so I’m really excited for him to attend his first BWI Pen Show. While on a short stop, David Oscarson will arrive early Saturday. He’s bringing his latest limited editions such as the Sagrada Familia, Sancta Lucia and many others. David’s pens can be ranked in the higher-end range of writing instruments. Not only will there be pen makers on hand, but we are also happy to have Tom Harvey of The Pen Guardian displaying his pocket pen cases. No pen show is complete without the Queen of Pens – the Energizer Bunny, if there ever was one, Susan Wirth. Susan brings many years of knowledge, personality, and experience. A stop at her table will be one to remember. Susan has pens most folks have never seen. She has an amazing ability to know exactly where and when the pens were made. Richard Vacca and his bride Evelyn will have the largest booth of vintage pens and memorabilia at the show, hauling their entire inventory from Hedgesville, WV. The pen show runs for 3 full days. Friday March 3rd from 11-6PM, Saturday March 4th from 10-5Pm, and finally Sunday March 5th from 10-4pm. Lamy starts 2017 with a new Special Edition Al Star collection, and they call it Pacific Blue. Lamy jumped on the bandwagon with special editions a few years ago. I had tried to get Lamy to make some kind of collectible in the Safari series for years. Finally in the early 2000’s, I commissioned 500 Lamy Safari Orange Flame fountain pens. This was a shiny, true-orange pen with a bright red clip. I just looked on Ebay and there is one being offered at $199.00! Not a bad return for a pen that originally sold for $35.00. So moving forward to 2017, Lamy just launched the Pacific Blue collection in Fountain Pen, Roller ball, and Ballpoint. There’s no set production number. Once the collection sells out, that’s it. The fountain pen comes in 7 nib sizes: Extra Fine, Fine, Medium, Broad, and 3 italics from 1.1mm 1.5mm and 1.9mm. The fountain pen uses Lamy Cartridges, or you can purchase the Z24 converter and fill the pen directly from a bottled ink color of your choice. Note that the fountain pen above has a slit in the barrel. This serves 2 purposes: 1) you’ll know which is the fountain pen vs. the rollerball, and even better, 2) the slit allows the user to see if there is any ink in the cartridge or converter. When either is getting close to empty, light comes through indicating a low level left… Pretty cool huh? The roller ball ships with a Lamy M63. Color options include black (ships with), blue, and red. The ballpoint with it’s classic rubber plunger comes with an M16 Black medium refill. Monteverde USA makes lots of M16 style refills to fit the Al Star Ballpoints. All pens ship in the Lamy Safari standard crate-like boxes, along with warranty information. Lamy pens, inks, and refills originate in Germany. A “Pacific Blue” special bottled ink and cartridges are also available. While the bottled ink does sell out much faster, the cartridges are also only available for a short time. See special prices for all three pens on the website. Finally, don’t forget the Baltimore Washington International Pen Show is 2 short weeks away. See you there! The fountain pen was invented by Waterman in 1884. Inspired by the old tradition of the feather quill, Waterman came up with a way to use the concept without having to be seated at a desk to keep the pen inked. The fountain pen became a staple of society until the ballpoint pen was invented in 1947. This limited the sale of fountain pens in the U.S, but not in Europe. The fountain pen has recently made resurgence in popularity mainly due to technological advances. Many people are now longing for the nostalgia of the hand written note. Nothing makes you feel better than to receive the personal touch of a note that someone took the time to sit and write. Many people wonder why they should use a fountain pen. Fountain pens offer an expression to a person’s handwriting. Through a change in pressure of the pen to the paper, you can achieve a variety of lines, from thick to thin. The ballpoint and rollerball will not give you this variety of line. Many people also believe that fountain pens improve their penmanship. The basic nature of a fountain pen forces the user to write a little more slowly, hence creating neater, more legible handwriting. Unlike a ballpoint or rollerball pen, a fountain pen allows for more choices when it comes to ink colors and shades. With a ballpoint or rollerball, blue is blue and black is black. That is not the case with fountain pen ink. The proper manner to hold a fountain pen is in the triangle created by your first two fingers and your thumb. The nib of the pen should be up, so that you may see the engraving (if any) on the nib; the black portion of the nib (the feed) should be down. The fountain pen nib is a piece of metal, either steel, gold or titanium, that is split down the center. 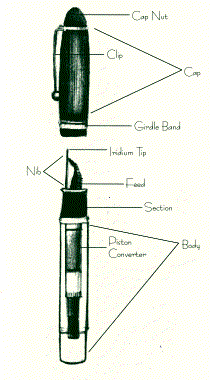 On the underside of the nib, on both pieces of the split, is a half ball of iridium. If the fountain pen is held properly, both tines of the nib should hit the paper at the same time, allowing for a smooth feel and a consistent flow of ink. There are two different ways to handle the cap of a fountain pen. Probably the most common manner is to post the cap on the back of the pen, aligning the clip with the nib. If the pen is held properly, the clip will be out of the way of your hand, and the cap will help with the balance of the pen in your hand. If the fountain pen feels uncomfortable in the hand, you may decide to use the cap in the “European” style, setting the cap on the desk as you write. Rather than setting the cap down, many people may decide to hold it in their non-writing hand. Ink should always be chosen by color preference, not by brand. You should only use ink that is designed for fountain pens, and you should NEVER use India Ink. India ink contains a lacquer that will seize the mechanism in a fountain pen and cause permanent and irreversible damage. If you choose to use bright colored inks, such as pinks, purples, and reds, use them in a dedicated pen. In other words, pick a pen and use that color only. Bright colored inks have the tendency to stain the barrels and converters of fountain pens. These ink choices are consistently less problematic and require low maintenance. Cartridges for fountain pens come in a variety of shapes and sizes. Some brands, such as Parker, Waterman, Aurora and Lamy use full-sized cartridges, cartridges that fill the entire barrel of the pen. Most other fountain pen brands including Mont Blanc, Cross, Visconti and Delta, use mini cartridges. When using a full-sized pen that requires a mini cartridge, you should drop one cartridge, narrow side down, into the barrel, and plug the other cartridge into the nib. This piggy-back system serves two purposes: you have a spare cartridge when your pierced cartridge runs out, and it creates a snug fit for the cartridge you are using. A pen that fills from a bottle requires a little more care than a cartridge pen; however, it is not as intimidating as most people would think. Most converters operate using a piston system. This requires a knob to be turned counter-clockwise to move the piston forward, immersing the entire nib into a bottle of ink, and then turning the knob clockwise to draw the ink. Once the converter or reservoir is filled, you should lift the nib out of the ink, turn the piston knob counter-clockwise to bleed out two or three drops, turn the pen nib up, and then turn the knob clockwise again. Bleeding the pen will allow for the normal expansion of liquid that occurs with a fountain pen. When cleaning the nib after filling your fountain pen, you should always use a paper towel. You never want to use tissue or cotton cloths, as they will leave lint in your nib, and you may experience ink flow inconsistencies. Remove the Nib from the feed and section. Place all parts including cap in an ultrasonic cleaner. Then take the filling system apart and lubricate all moving parts. Brush clean the feed and then reassemble the pen taking care to set the nib square on the feed. Hint: By leaving the cap on the back of the pen and cleaning it last, you can use it as a guide to reposition the nib in its original Slot or key. Note: Most modern converters and pistons can be dissembled with the right tools and “know how.” This does not include a hammer. sudsy ammonia. Do not let the water get hot. Do not clean any part of the pen that is celluloid in this solution. It is advisable to rinse before and after with cool tap water. Allow all parts that will come in contact with ink to complete dry. Hint: In a pinch Windex with Ammonia works as a cleaning solution straight out of the bottle. There is a regular monthly maintenance procedure that you should follow with your fountain pen. It is recommended that you flush your fountain pen with cool, clear water on a monthly basis. The easiest way to flush a pen that has a converter or piston is to draw clear water as you would ink, expel the water, and repeat this until the water coming out of your pen is clear. It is a repetitive process that may take a little while, but it is necessary. You should also do the flush whenever you change ink colors or brands. You can also remove the converter clean that part on its own by filling and emptying, then run cool water from the tap through the back of the pen blowing through it until the ink color is gone. Remember to blow dry or air dry the nib section and converter completely. Hint: When you blow through the pen keep your head deep in the sink to avoid splatter. If the water you expel from the fountain pen doesn’t lose color after persistent flushing, and your pen and it is NOT made of celluloid, you may use a mix of 3:1 solution of water to sudsy ammonia. Fountain pen ink is ammonia soluble and this solution will break down any dried ink that cannot be loosened with plain water. Be advised: Celluloid is also ammonia soluble, so DO NOT use this solution if you pen is celluloid. When in doubt, just use the water. Hint: Clean out the cap of the pen too, If you don’t and ink is present, it might flow down on the nib and make the pen appear to be leaking even if the ink appears to be dry on the inside of the cap. Moisture (evaporation) from the ink in the pen will hydrate the ink in the cap after filling and capping. Getting the pen back to square one option. Let me clean, inspect, adjust the nib and lubricate the pen for $15.00 plus $6.95 shipping and insurance. Usually I can get them shipped back to you via UPS in one or two days. I am factory trained by Montblanc, Aurora, Visconti, Omas and Delta. Also, I have a good working knowledge of Pelikan, Lamy, Stipula, Waterman, Parker and several other brands. Hint: Send in several pens to amortize the shipping cost. Note: If you break the pen it is your problem. If I break it, it is still your problem, but it costs you far less because I have to pay to fix it. After all, at that point I am the one who made the mistake, not you. I do not want to make it seem that stripping down a pen causes them to break, but stuff happens. When it comes to getting ink on your hands, there are several options that you have to remove it. Amodex is a product available on the market that will remove fountain pen ink from skin and many fabrics. It has a lotion consistency that is gentle on your skin, and works like a dream! Soap and water is always an acceptable way to remove ink from hands. It may require some scrubbing, depending on the water resis-tance of the ink. In a pinch, when neither Amodex nor a sink are available, spritzing your hands with a little Windex will also help to remove the ink. As previously mentioned, fountain pen ink is ammonia soluble, and Windex has enough ammonia to remove the ink without having other solvents that would damage your hands. Filled fountain pens should always be stored nib up, as they would be in a shirt pocket. You should never store a fountain pen nib down…GRAVITY WORKS. Filled fountain pens should never be stored for an extended period of time. When you fill a pen, consider it a commitment to use it. Storing a pen that is filled with ink could cause the ink to dry in the pen, and create flow problems and possible piston damage. If you plan on storing your fountain pen for an extended period of time, you should always empty the pen and flush it before putting it away. This will ensure that the barrel is clean and there is no ink inside that will lock the piston and create a problem that may need a professional repair. It’s great to go back a mere 10 years ago, and to see what we thought were good guidelines for use of fountain pens. Of course, some things have changed since then, but the basics have not. Stay tuned for our revised edition of “Pen Stuff”! If you are in the Rockville Area, feel free to stop by and visit!